No matter which type of carport you’re looking for, we’re sure to have it, and if we don’t, we’ll gladly customize one for you! Why is Alan’s Factory Outlet the best source of carports for sale in Texas? The first reason is affordability. Our well-built carports come at great prices, and when you buy metal carports in Texas, you can save even more because we offer free delivery and setup! Another reason why so many people turn to us when they need carports and garages is that we have a huge variety of options, so you can get exactly the right size and style for your needs, whether you need Texas carports tall enough for an RV, wide enough to hold your tractors, or with a color and roof style that matches your house. How Do Texans Use Our Carports? Our sturdy metal carports can give your car, truck, boat, RV, farm equipment, and other valuables the perfect protection from the rain, hail, ice, snow, wind, and sun. That’s why so many people in Texas and all over the country use our carports to protect their possessions. But that’s not all you can do with a carport: Family gatherings, outdoor picnics, and parties can also be protected from the elements under a carport. Texas buyers routinely use them to provide shaded work areas for gardening or woodworking as well. And thanks to the lightweight yet durable construction of our carports, Texas residents can relocate these structures to other parts of their property or even take them along if they move away. We sell metal carports in Texas in a wide array of sizes, starting at our smallest model, the 12-by-21 single carport, and ranging up to 24 by 41 feet. If you’re looking for Texas carports wider than 24 feet, we can do that: Our triple-wide carports come in sizes up to 30 by 41 feet. Still not big enough? 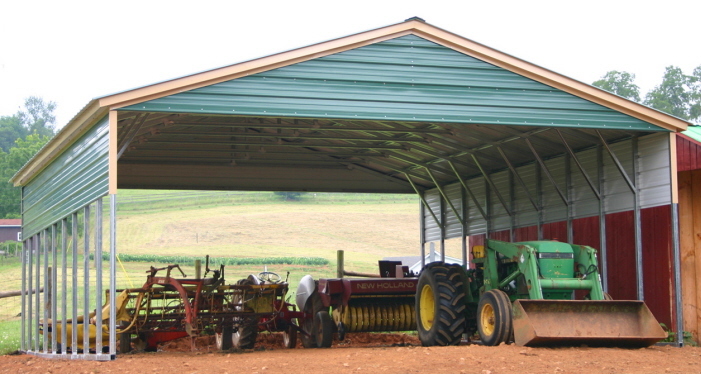 Take a look at our metal barn lean-tos, which are available as large as 48 by 41 feet. But if even this wide variety of options isn’t quite what you’re looking for, you can get a customized carport built to your specifications. When they need quick delivery on high-quality carports, Texas residents from El Paso to Houston know that they can trust Alan’s Factory Outlet to help them get what they need and save money. Take advantage of our great prices by ordering online now, or contact us to speak with our knowledgeable staff about your options. We’d be glad to serve you!